2 to 3 hours recharging time, up to 6-8 hours play time. Partying indoors? Grilling out on the patio? Relaxing on the beach? Whatever your are doing, the POPCHOSE MINI Soundbar is the only Bluetooth Soundbar you'll ever need! Anti-scratch design for the mobile DJ, music and movie lover. It will wow you with powerful sound quality and volume that will never sacrifice clarity. Super BASS technology, Stereo Audio system with high fidelity, Built-in advanced full range top quality speakers for HI-FI sound enjoyment. Rubber coating material, mini, slim outlook design makes the speaker more fashionable. Make any room look better. Supports 3.5mm audio input for the devices without Bluetooth function, TF card and U-disk music play, FM radio and hands-free calling. Bluetooth 2.1 Version can support 33ft BT distance. Best set up in living rooms, game rooms, or home theatres. - Press the M button to choose the mode. - Feel like you're at the movies with booming HD sound! 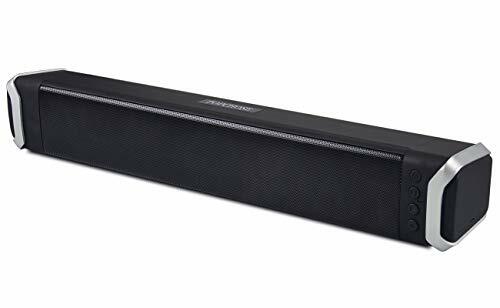 What We Offer: 1 x USB Powered Soundbar, 1 x User Manual, 30-Day Money Back Guarantee, 12-Month Product Replacement Warranty and 24-Hour Friendly Customer Service. Feel free to contact us with any questions you may have. We will respond to your questions quickly. Crystal Clear Hifi Sound: 2.0 Channel AUDIO and two full range high quality speakers for high performance multi-dimensional sound and an unparalleled cinematic deep bass surround sound let you enjoy high-quality crystal clear Hifi sound. Unique Design and Desktop Technology: Built in battery, compact and portable, easy to carry, up to 6-8 continuous music times. Rubber coating material, mini, slim outlook design makes the speaker more fashionable. Makes any room more stylish. Multifunctional Bluetooth Soundbar: Three modes conversion (Bluetooth, FM Radio, TF Card). Supports 3.5mm audio input for devices without Bluetooth function, TF card and USB flash drive music play, FM radio and hands-free calling. Easy To Use: Press the M button to choose the mode. Pair with your phone, connect to your TV and enjoy the radio. Easily turn your TV into an entertainment system. Enjoy high quality theater sound in the comfort of your own home. If you have any questions about this product by POPCHOSE, contact us by completing and submitting the form below. If you are looking for a specif part number, please include it with your message.